This Is Your Captain Speaking: Wrong Engine Shut Down? The data readout from TransAsia's flight data recorder has been made available. The first warning in the cockpit was associated with the right hand engine (No. 2). The crew next discussed a failure associated with the left engine (No. 1). The left engine was then throttled back and shut down. Shortly thereafter the right hand engine auto-feathered. This is an automatic feature on the ATR 72 which feathers the propeller (aligns it with the windstream to reduce drag) when the power from the engine falls below 18%. This is essentially an engine failure of the right hand engine and though it continued to run, it was not producing thrust. The crew then discussed and attempted a relight of the left hand engine. Engine data suggest that the relight on the left hand engine was successful though perhaps too late to recover the aircraft. The ATR 72 also features an automatic yaw compensator which would automatically apply rudder to counteract any adverse yaw resulting from an engine failure. All these automatic features are designed to reduce the workload on the pilots in the event of an engine failure on takeoff. What they cannot do is counter basic airmanship mistakes such as misidentifying and shutting down the wrong engine. There has been some discussion that perhaps there were miswired engine indicators. This is not an unknown occurrence, but pilots should use all available resources to make a determination of a failed engine. This would include other gauges such as fuel flow and exhaust temperature and also the performance of the aircraft itself. The aircraft will always yaw towards the failed engine. In any event, miswired engine indicators should be noticed on engine start. If starting the left engine and the right hand RPM indicator spins up, that would be a big clue. At this point there is no evidence of miswired gauges. 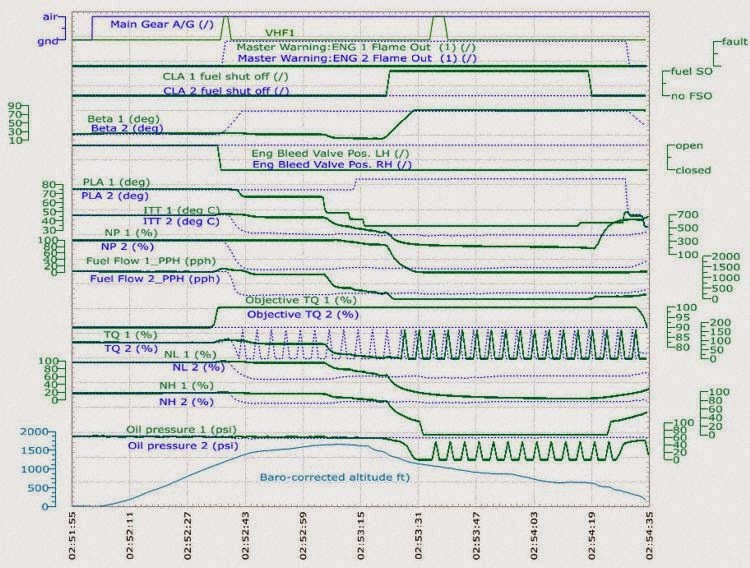 An engine loss of thrust at 1000 ft agl (above ground level) should be no cause to take rash action. The aircraft is flying and will continue to fly well with only one engine. In this event, a proper course of action would have been to continue to fly the aircraft to altitude and then to methodically proceed through engine failure checklists.